When people mention big fighting robots and Anime, two series tend to come to mind - Macross (whose designs should be familiar to longtime Battletech fans, as well,) and Gundam. 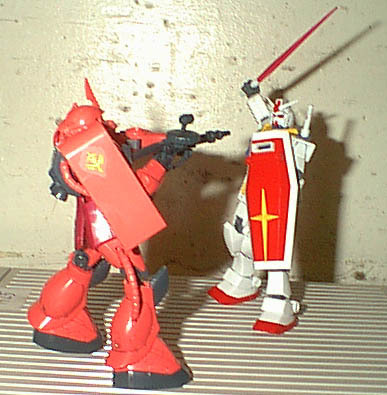 The Gundam series started off a long, popular set of shows, movies, and OVA (released only on video) movies, and Mobile Suit Gundam is the series that started it off. The series starts with the One Year War, where the Earth colonies on the other side of the moon declare themselves the Principality of Zeon, and fight for their independace from the Earth. It's not a clear-cut "good vs bad" story, by any means. By comparison with the later series, the artwork might seem - well, simpler, but it's a worthwhile story that gives the basis for all future Gundam stories. The kit is one of the High Grade series of 1/144 kits. This gives a bit more detailing and flexibility than the usual 1/144 kits (usually reflected in the price, $14 or so vs. $10.) It is produced in the usual multi-colored plastic sprues (including tinted clear plastic for the "beam saber" blades, a nice change from painting them.) It is of snap-together construction, with poly caps for joints and connection points. IN general, construction is very simple. I've gone over it in other reviews, but as a quick recap, it's snap-together plastic, usually with poly caps sandwiched between. Parts are typically in the colored plastic they end up in. I didn't see anything that required painting to match the prototype, but with its rather large, solid blocks of color, you will want to highlight panel lines, and possibly "wear" bits and pieces with silver to highlight. (I went over the panel lines with a pen, which brought them out well and gives some definition to the shapes.) You'll also want to bring out the detail on the back of the shield, which is otherwise lost in the expanse of white plastic. Of all of them so far that "don't require paint," this one most lives up to it. The panels on the skirt armor, the neck pieces, the center of the head fins, and th events on the chest are all seperate pieces, not mounted in the base plastic color. The shield, too, is actually made in six pieces - three for the handle, the white back, the yellow "cross," and red outer face. No painting! There are no elaborate shoulder pads to edge in another color. The only thing I'd paint (I used the kit decals for this) would be the face, as the decals just don't like settling down where they're supposed to go. 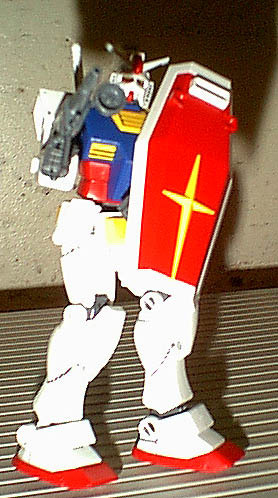 You're also given the option of hands, two "normal" ones for the shield and/or beam sabres (white handles, clear plastic blades,) and one mounted permanently around the beam gun. They pop in and out securely, but easily. For what I consider one of the more "basic" looking designs, I'm glad I picked this kit up and built it. Build one or two of the cheaper kits in this scale to get an idea of what you need to do in construction, then tackle this one's slightly more complex structure. 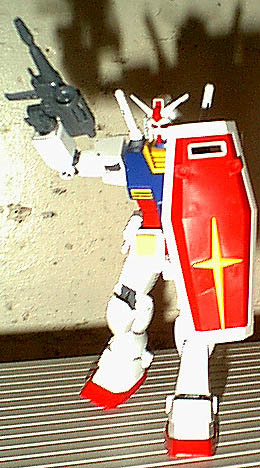 You'll enjoy it, and get the "daddy" of the Gundam series to add to your collectoin. Reccommended heartily.